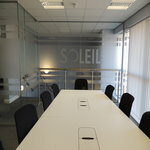 Soleil Food Services were looking to relocate to a much larger office facility in Wrexham, North Wales. After various meetings and discussions with CSI a design and full scope of works was put together and agreed with the client. The project worth £80k was completed in 10 weeks and involved a new air conditioning system, door access control system, fire alarm modifications, new lighting and small power and data. 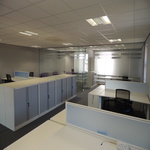 In addition we fitted single glazed partitions, blinds, carpets, decoration, seating and office furniture. A full concept to completion scheme, delivered to budget and on time.